The 2nd of August of this year will mark the Earth overshoot Day. Yearly calculated by the Global Footprint Network (GFN), an international non-profit organisation engaged in the promotion of a more sustainable future which keeps track of the human ecological footprint, Earth Overshoot Day marks the date on which humanity’s resource consumption, in a given year, outpace the world biocapacity to regenerate those resources that year. As of 2017, GFN estimates that humanity has been using natural capital 1.7 times as fast as nature can renew it. As a matter of fact, the rising costs of ecological overspending are becoming more and more evident over time, as demonstrated by deforestation, fisheries collapse, drought, species loss, soil erosion and the relentless rise of carbon dioxide in the Earth’s atmosphere. However, a series of solutions targeting four major fields – food, cities, population and energy – have been identified, with the aim to reverse this trend and improve sustainability. To this end, the #movethedate campaign has launched a series of pledges that can help to create a more sustainable future. The most significant factor contributing to the global Ecological Footprint is carbon dioxide emissions from food supply and consumption. Indeed, our food choices do have the potential to increase or decrease our footprint. Fortunately, when it comes to foods there are good practices that, if implemented, can help reduce gas emissions and foster sustainability; for instance, changing the consumption patterns in favour of those foods which production requires a smaller amount of resources as well as minimising food waste – which is also one of the targets of the UN Sustainable Development Goals – is pivotal for moving the date of Earth Overshoot Day forward and reduce our ecological footprint. For instance, good practices and recommendations of the #movethedate campaign include trying a new vegetarian recipe, since reducing meat consumption is a great way to reduce our Ecological Footprint, or improving operations to reduce waste by reducing how much we buy and consume in our everyday life. 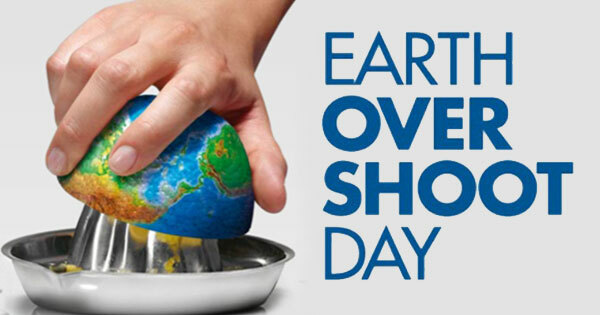 You can find more information on Earth Overshoot Day and how to #movethedate on http://www.overshootday.org/.